Disc brakes have outstanding stopping performance and smooth brake action. Drum brakes are an economical option for braking performance. In-line brake actuators on up to 7500# GVWR models yield a sleek appearance. Rubber torsion axles offer a smoother independent suspension. Swing tongues on models up to 7500# GVWR models shorten the overall trailer length by 12″ to 18″. Swing tongues on models up to 10,000# GVWR models shorten the overall trailer length by 12″ to 18″. The ski boat package includes a protective prop cage, extended dove tail and tall pole load guides. Retractable transom tie downs are easy to use and provide superior holding power. Recessed tail lights are sleeker. L.E.D. lights are brighter and longer lasting. 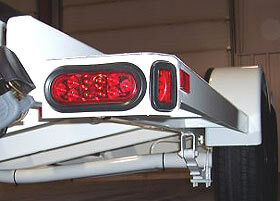 Reverse lights illuminate when backing up. Galvanizing offers long term corrosion protection for harsh conditions. Upgrade to chrome rims or aluminum mags for the added custom touch. Matching spare tires are available in all sizes and wheel styles. Trailgard is a high chip & impact resistant polyurethane textured coating. 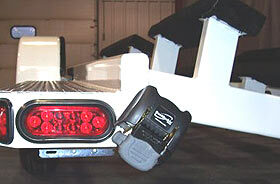 It is especially effective for a trailer that is towed on gravel roads. Interested in becoming a Trailmaster/Vanguard dealer? Established in 1979, J.Q. Tex, Inc. is the Midwest's leading custom boat trailer manufacturer. The custom designed fully welded bunk trailers accommodate boats from 12' to 48' in length with carrying capacities ranging from 1000#'s to 20,000#'s. We offer both "C" channel and box tube construction in the Trailmaster line. The top of the line Vanguard tube trailers includes many premium features. Our family owned and operated firm is committed to building boat trailers of superior quality and value.